When the ceremony is complete, the reception begins. Portland's own Certified Balloon Artists, Wynn and Lindy Bell, owners of Final Touch Balloons & Event Decor, will provide you and your guests with elegant wedding decorations that will make your wedding not only memorable, but also Magical. 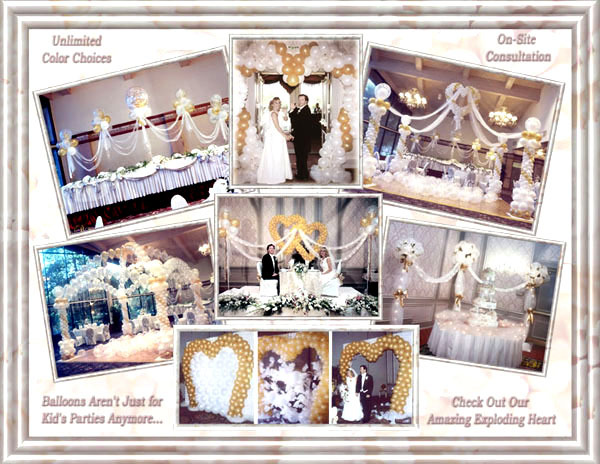 Click on the Wedding Packages link to see samples of work done by Final Touch Balloons & Event Decor, Portland, Oregon, as well as wedding package pricing and individual item sample prices of some of the elegant decor designs we can create for your wedding. If you like what you see, contact us via e-mail or directly for all your Portland area Wedding and Reception decorating needs. We realize that the decorations for your wedding reception are very high on your list of must haves and "must be perfect" items. Our owners specialize in decorating wedding receptions. Wynn and Lindy began decorating wedding receptions in 1989. Since then, they have gone on to win multiple international balloon sculpture competitions and are considered by many in the balloon artist community to be among the top ten balloon artists in the world. If marriage vows are in your future, and you live in the Portland, Oregon area, let Wynn & Lindy help make your dream wedding a reality. They can create anything you wish, from a spectacular Exploding Heart to introduce the new Mr. & Mrs. at the beginning of the reception, to reception table centerpieces, balloon arches, Dance Floor Canopies, or even very simple balloon arrangements for the bride who wishes only an "accent" of balloons. Because you plan to be married for a lifetime, Final Touch Balloons & Event Decor has just what you need to make your wedding ceremony and wedding reception decorations magical and memorable and ones that you and your guests will remember for a lifetime. When your guests first enter your reception through our Magic Moment Wedding Heart Decoration, they will feel surrounded by your love for each other. After your wedding party has been announced, the announcement of the bride and groom will be the highlight of the wedding reception as the new Mr. and Mrs. enter through our amazing Wedding Reception Exploding Heart Entry Decoration. Then you will share your first dance together as husband and wife under our romatic Wedding Reception Dance Floor Canopy, or another dance floor treatment called our Wedding Reception Cherish Heart Canopy,.and then share your first meal gazing into each other's eyes across our romantic Table for Two Wedding Reception Head Table Decor. When you are ready to cut your wedding cake, your pictures will be spectacular with our ever popular Cake Table Reception Decoration as your backdrop. Also, because there are more and more theme weddings happening each you, check out our link for Theme Party Decorations. If the pictures you have seen have peaked your interest and you'd like to see more, check out the other links at the top of this page, or see more pictures of Wedding Decorations and Corporate Event Decorations on our picture page. Although these pictures are smaller, they certainly can give you more of an idea about balloon decor.